I'm probably not the only one whose Instagram feed is mostly food, and it's honestly where I get a lot of inspiration for weeknight meals, weekend baking projects, and all the snacks in between. 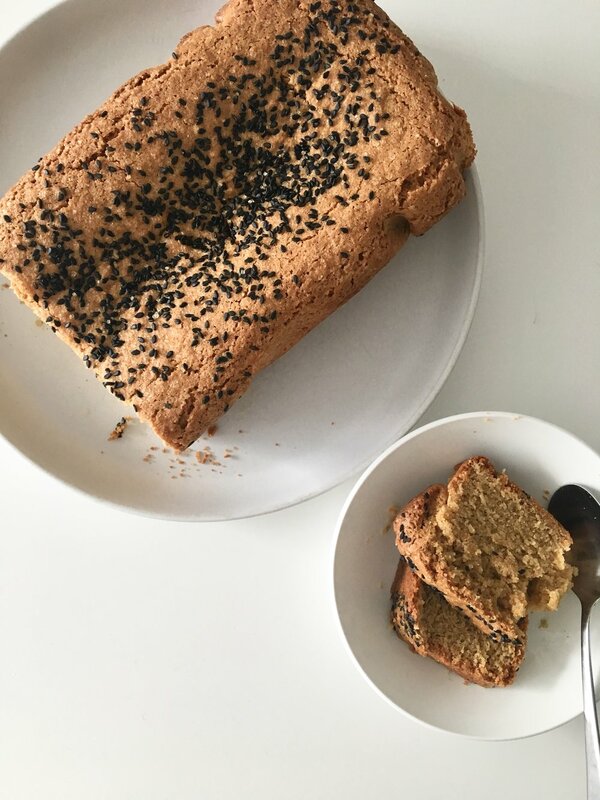 I'm such a sucker for banana bread, but when I saw this swirled sesame tea cake... mind. blown. First, it's gorgeous. And second, it utilizes an ingredient that I usually have in my fridge but I almost never use! Tahini is ground sesame, this beautiful light golden paste that's nutty and savory. It's also one of the main ingredients in hummus, giving it it's rich flavor. If you've read any of my blog posts or Instagram posts, you know I'm impatient and can't be bothered with all the extra bowls & baking steps. And so, this version of this bread was born! Coat bread loaf pan with nonstick oil spray OR thin layer of ghee. Then, line pan with parchment paper, so that paper comes up above the sides of the pan. Once more, coat parchment paper with nonstick spray OR thin layer of ghee. Sprinkle sesame seeds and sugar to coat parchment liner, tapping to evenly coat pan liner. In a large mixing bowl, whisk together all dry ingredients. In a small mixing bowl, combine yogurt and tahini. It might separate a little bit, but mix it until it's thoroughly combined. In another large mixing bowl, with a hand mixer (or standing mixer if you have one), beat sugar, eggs, and vanilla together until pale in color and thickened. Add in olive oil and sesame oil and beat until thoroughly combined. Add dry ingredients and yogurt & tahini mixture alternately to the bowl with the wet ingredients (sugar, eggs, and vanilla)—dry, then yogurt & tahini mixture, then dry, then mixture, ending with dry. Pour batter into the bread loaf pan, and sprinkle the top with more sesame seeds and sugar. Bake for 55-65 minutes, until golden brown and no longer gooey in the center. Lift parchment & bread together out of the pan to allow to cool. Serve warm topped with coconut yogurt & berries, or slathered with almond butter, or grab a slice straight out of the bread loaf pan (go ahead, no one's judging). 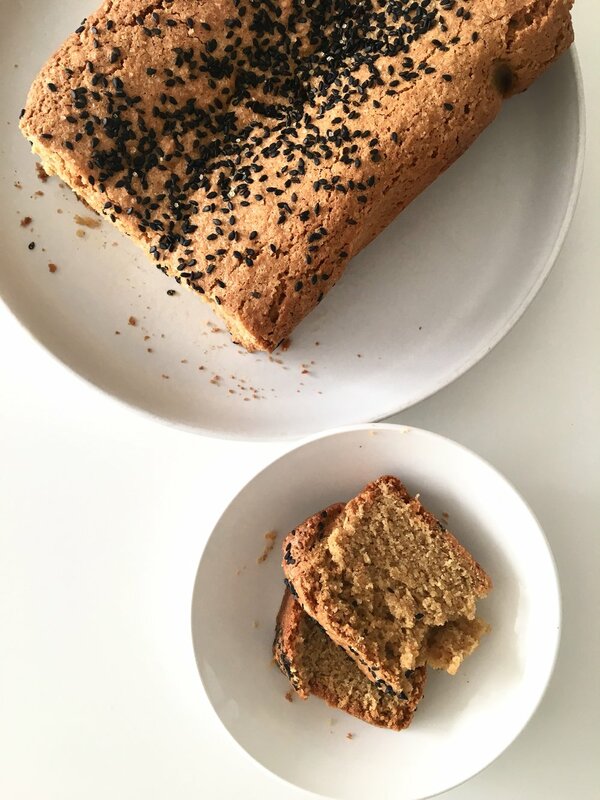 Adapted from bon appetit's swirled sesame tea cake.